Sterling Silver/14k gold Diamond Heart Ring,0.18ct diamonds.Price includes 30% discount. Sterling Silver / 14K Gold Diamond Heart RingMake a bold statement with flashes of romantic drama. 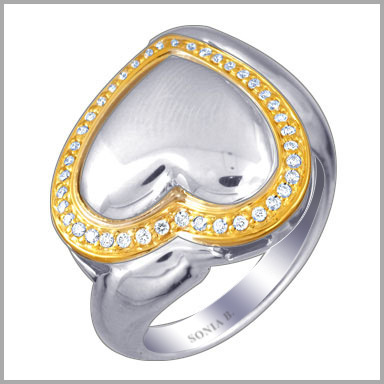 This exceptional heart shaped ring is crafted in polished sterling silver and 14K yellow gold. It features 41 full round cut diamonds in prong settings at the perimeter in gold. The total diamond weight is approximately 0.18ct with a color of H-I and a clarity of SI-3. The setting size is 5/8" x 13/16" with a height of 3/16". It also has an undergallery for added beauty and comfort. " I love this ring because of the unique placement of the heart and the use of multiple metals. The diamonds add that special touch. You can wear this ring with your other yellow gold pieces as well as Sonia's other silver designs. Balanced well and just a fun ring. I highly recommend this ring if you are looking for a different heart design to add to your collection. You will not be disappointed!